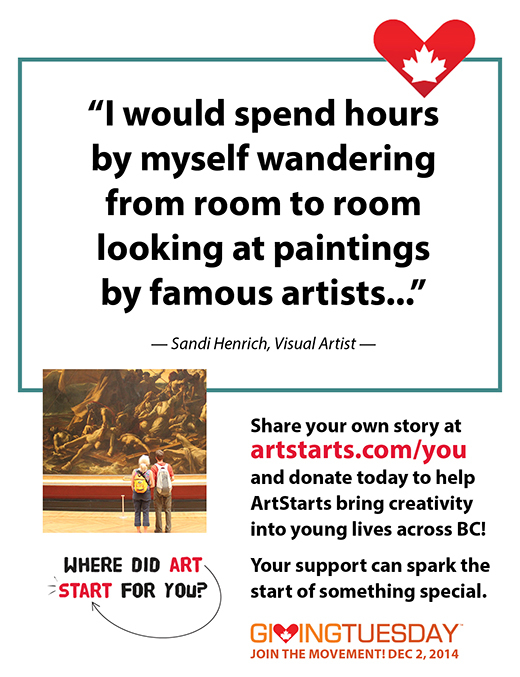 In the days leading up to GivingTuesday on December 2, 2014, we are sharing stories from artists in the ArtStarts community. We asked them, "Where did art start for you?" It's a question that asks us to reflect on our own lives in order to see where along our journey our passion for the arts was sparked. GivingTuesday is a movement for giving and volunteering that takes place this year on December 2, 2014. Taking place each year right after Black Friday and Cyber Monday, GivingTuesday is proof that the holiday season can be about both giving and giving back. GivingTuesday is the perfect time for the world to come together and show how powerful humanity can be when we unite to give on one day. ArtStarts fosters creative experiences for young people. Your support can spark the start of something special. Donate today or on December 2, 2014 to help ArtStarts bring creativity into young lives across BC! Choose Interac Online when you donate here on December 2, 2014 and Interac will match up to your donation, up to $25. Your $25 donation becomes $50! Click here to donate via Canada Helps on December 2, 2014—and remember to select Interac Online as your payment method. Where did art start for you? As a teenager in Ottawa I made many visits to the National Gallery. At the time (1970’s) the collection was temporarily located in an office building on Elgin Street and admission was free. I would spend hours by myself wandering from room to room looking at paintings by famous artists and discovering artists that were new to me. I felt a connection to the people who had created this art - through time and space - and it was magical. A life-long interest in art and art education grew - and I am now a full-time artist, art teacher and facilitator. I am inspired seeing my students at work on their art; making new discoveries, trying new things, growing in new ways and finding satisfaction in being creative and expressing their ideas. Now, whether I am looking at The Group of Seven paintings in the National Gallery in Ottawa, Impressionist art in Paris, or a preschool student’s artistic interpretation of a spring garden - that magical feeling is the same.